I've made it about halfway through Orson Scott Card's nearly 30 year-old novel and needless to say I expected some pretty great things. The deal is though, that despite the fact I was attempting to finish the novel prior to seeing the finally realized film adaptation of said unfilmable book I never felt as if the story took off or that it was going to anytime soon and it made no clear path for what direction it wanted to go in. That said, I was anxious to see what the movie would do with this and, as I didn't know the ending to the first chapter of Ender's saga, hopeful that I might be proved wrong in expecting the story to amount to much more than the now tired premonition that children would make better soldiers than adults because of their over-indulgence in video games. Turns out, Card seems to have had the idea for the final act before having anything else and had to figure out a world to build around this idea that would allow a functional story to be told leading up to it. The conclusion was likely the best part of the film, and that isn't saying the rest is bad, but it certainly feels as if the film finally gets going and gets into the thick of things just short of rolling the credits on us. 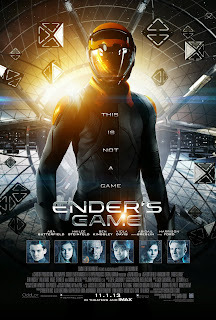 Having said that, there is much to like about Ender's Game, but there isn't much to love or get excited about. As I walked into the film I knew better than to hope for a traditional adventure film, but was still optimistic this might serve as another entry in a rather good year for sci-fi that would remind me of films like Jumanji that would take me to a different world and that I could put on repeat as a child. Having given such credit to 2011's Real Steel and Pacific Rim earlier this summer, I was more than willing to believe Ender's Game would have a similar effect on me, but this is a much more serious film than it purports to be and despite the average age of its cast member is a movie filled with mature dialogue that will have some kiddos turning to their parents and asking what is going on while all they'll really be waiting on are more scenes in the zero gravity battle room. As a fan of science fiction and an inherently nerdy person when it comes to the great beyond, themes of reality and perception, and the psychology of humanity among other things I was intrigued and entertained by the film despite the fact it lacks a consistent tone and hook that will keep its audience more in tune with the time rather than allowing them to get lost in space. 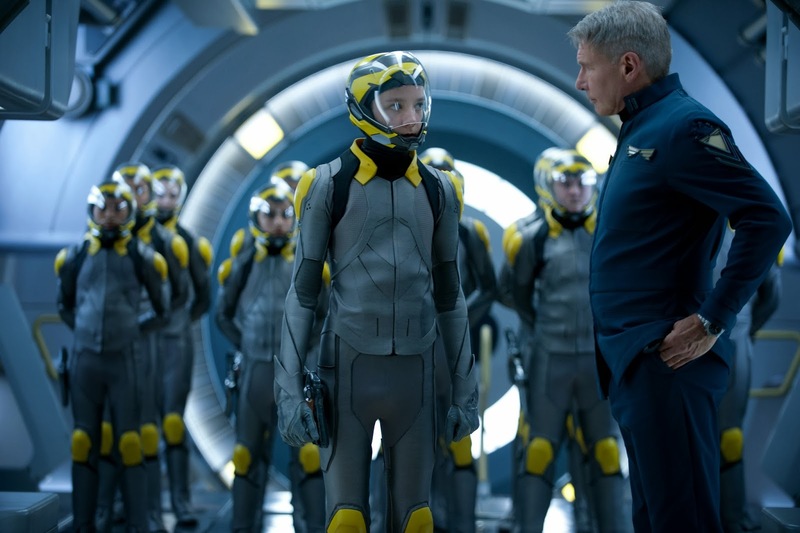 Ender Wiggin (Asa Butterfield) reports to Colonel Hyrum Gaff (Harrison Ford) before going into battle. The thing with this adaptation though is that it is so clearly setting the table for what is to come next if this solid enough first entry turns a great enough profit. Don't get me wrong, I'm all for franchises and more sci-fi films being all but guaranteed in the future, but in a film industry that is constantly setting up what is to come next it would be nice to feel like someone really cared about the now so that there is reason to genuinely be excited about the next. This is where I come to a conflict with Ender's Game. If you are unfamiliar with the story it revolves around the titular character Ender Wiggin (Hugo's Asa Butterfield) who is a rather shy but strategically brilliant young boy that is recruited by the International Military and more specifically by esteemed Colonel Hyrum Graff (Harrison Ford) in an effort to find the next great leader that might help Earth overcome the threat of an alien race that they defeated fifty years earlier. Everyone on earth is scared that the Formics (the aliens) are either preparing to return to fight again or are already set with a battle plan that we will need to be ready to defend at a moments notice. Thus is the reason Colonel Graff and Major Gwen Anderson (Viola Davis) pull Ender from his normal schooling and ask him to join the select few that are admitted to the battle school, a space station that trains and weeds out which children will make great soldiers and even more, exceptional leaders. Graff sees something in Ender from the get go as he had high hopes for his older brother Peter (Jimmy Pinchak) who possessed too much anger while Ender's older sister Valentine (Abigail Breslin) contained too much compassion. Graff makes it clear to Ender he needs to find a balance in these qualities his brother and sister possess if he wishes to be successful and he seems to do this almost effortlessly as he distinguishes himself from the rest nearly as soon as he arrives at the battle school. While he moves up the ranks quicker than any other "launchie" he manages to make a few friends in the form of Petra (True Grit's Hailee Steinfeld), Bean (Aramis Knight) and Alai (Suraj Partha) as well as a few enemies like Bonzo (Moises Arias who I had a hard time taking seriously after his hilarious turn in Kings of Summer) who leads the Salamander Army and is keen to shut down Ender's potential. The young "chosen one" cannot be stopped though and despite the fact we seemingly trust Ender will fulfill Graff's prophecy we don't exactly know what that means he is going to accomplish. As I said, the issue I'm having with the book so far is that despite there being a clear threat of this alien race who once attacked and killed a massive amount of human beings there is no definitive goal anyone is working towards or event that is scheduled to occur that sets up any kind of tension for these child soldiers to lock onto and motivate them to move forward. It is simply an imminent threat that must be prepared for at all times and so as an audience member we wonder what exactly is going to cause this waiting game to come to a head other than the fact this is the section of the story they decided to make a movie about? To answer this question is to divulge some of the details of the plots second act that finds far better footing than the world-establishing, expository-filled first act that accomplishes introducing us to the large cast of characters and aiding us in understanding what is going on and how things are done, but not so much in a way that we feel settled in and comfortable with our surroundings when the story decides to step it up a notch and start throwing psychological curve balls at us. I doubt this is the fault of writer/director Gavin Hood (X-Men Origins: Wolverine) as he has seemingly done a fine job at condensing the major plot points down into a reasonable running time while not having to sacrifice any major aspects of the book that contributed heavily to the narrative. Knowing the writing style and delivery of information that exists in the first half of Card's novel while not knowing the ending of the book proved an interesting way to interpret the film. Who knows, once I finish the book I may like or dislike the film more, but as of now I understand how Hood went about bringing these words to the screen and had the ability to make it almost feel effortless while experiencing the film as if it were a new entity in its climactic sequences and resolutions. Taking all of this into consideration gives the film the benefit of the doubt in that those experiencing it all for the first time and having no prior knowledge before stepping into the theater might have a more flattering experience while those who've enjoyed the book might be slightly disappointed in ways only good adaptations of highly praised literary works can. Still this isn't a review of how well the movie was adapted from the book, it is about the entertainment value and quality of the motion picture and in that regard it feels far too commonplace to contain such extraordinary circumstances. Petra Arkanian (Hailee Steinfeld) helps train Ender in battle tactics after he's abruptly promoted. While it may sound as if I was rather disappointed in the film overall it is instead that I just wanted it to be more innovative than it turned out to be, but can admit to being truly satisfied in the way the film concludes and the prospect of more films based on the novels that span the universe of Ender Wiggin is very exciting. Besides some ill-will towards the ability to establish the world here, Hood is more capable than I suspected after his Wolverine film was more or less one of the bigger disappointments of the last decade. He handles his grand scale with a much more confident and steady hand than before as the visuals are nearly breathtaking once our young Ender and Colonel Graff make their way into space with the simulated battles taking the cake for the most visually appealing moments in the film and also fairing well to entertain the younger members of the audiences while the older set become more entranced with psychological elements represented by a game Ender begins messing around with on what is essentially his iPad. Hood is working with a fine cast that is balanced by giving equal time to the pedigreed veterans like Ford and Davis as well as Ben Kingsley showing up about halfway through and transcending his silly make-up to deliver nothing less than what is expected of the great thespian. The younger cast members more than pull their weight as well though as both Steinfeld and Butterfield do fine work at naturally commanding the screen whenever they take it and delivering a natural arc in the case of Ender and being able to let us into what type of person their character is despite a lack of any real development as is the case with Petra. The fellow battle school recruits do well to fill in the empty spaces and each fittingly has a kind of connection with our main character that sustains their purpose in the plot, but the film understands where its focal point should be and Butterfield, despite his meek physical appearance and rather timid vocal tones, is able to transform into a convincing leader that we believe in. It should also be of note that Abigail Breslin shows up and does some interesting work as Ender's emotional anchor that is sure to prove more relevant in future films. With a somewhat standard, but fitting score from Steve Joblonsky (The Island) and expensive looking special effects Ender's Game has an appealing surface look made more appealing by the fact it grows more and more strange and interesting with each passing scene. It's a shame it takes as long as it does to find a groove, but hopefully the sequels will be a major payoff for this understandably conformist first step.